We define a logical system with four values, the traditional truth values T and F and two “Unknown” values. An inference system based on this logic has the capability to remember all the paths followed during an attempt to answer a question. For each path it records the used hypotheses (the hypotheses that constitute the path), the missing hypothesis (when the path did not lead to an answer), and why it was assumed as missing. The inference system takes special care with missing hypotheses that are contradictory with any hypothesis that is being considered. An inference system with these capabilities can report the answers found and the reasons that prevented the inference of other potential answers. This capability can be used to plan reasoning, to perform default reasoning, and to reason about its own knowledge. This work was partially supported by Fundação Luso Americana para o Desenvolvimento (FLAD), by Instituto de Engenharia de Sistemas e Computadores (INESC), and by Grant 87–107 of Junta Nacional de Investigação Científica e Tecnológica (JNICT). 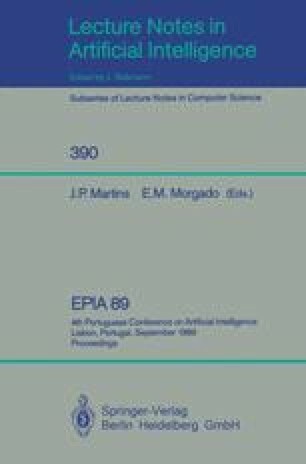 This paper describes research done during the months of March, April and May 1989 at the Department of Computer Science, State University of New York at Buffalo.